In 2019 APIEM is hosting a series of conferences, seminars and workshops in India, Indonesia, Malaysia, Taiwan and the Philippines to contribute to the professionalisation of the Asia Pacific events/MICE industry. – please visit www.apiemconferences.com for further information. Our conference program will bring together events/MICE industry professionals, faculty members and researchers to share their knowledge about this great industry. All papers presented at the APIEM conferences will be published to contribute further to the body of knowledge on contemporary events/MICE developments. 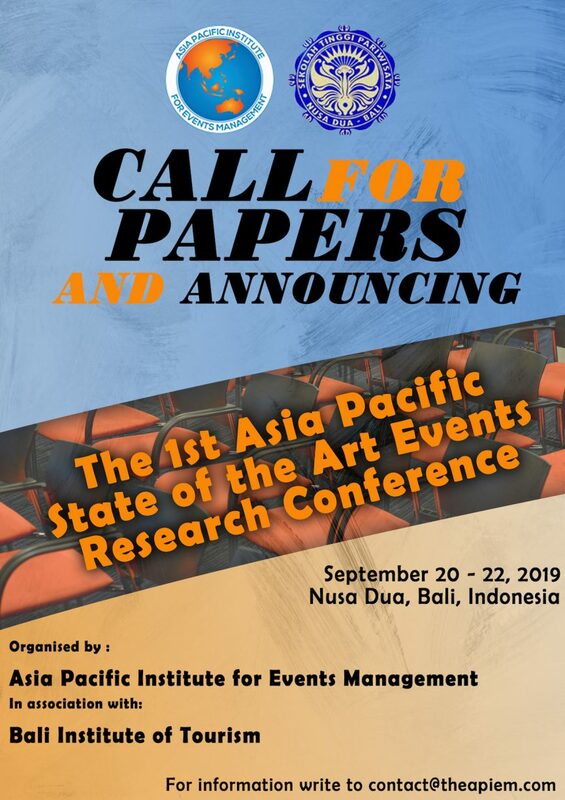 APIEM`s signature conference is called the 1st Asia Pacific State of the Art Events Management conference and is being held 20 – 22 September in Bali Indonesia. This conference will provide an opportunity for events/MICE professionals to share their research on a great variety of topics with our international audience. The co-host of this conference is the wonderful Sekolah Tinggi Pariwisata Nusa Dua Bali (STP Bali). STP Bali will provide the benue for our conference and will work with APIEM on all the logistical arrangements for the conference. Conferences on specific themes also take place in Malaysia, Philippines, India, Taiwan and Indonesia. We look forward to meeting you at one of our great conferences, seminars or workshops in 2019. If you require further information please write to apiem.ems@gmail.com – we look forward to hearing from you.